Our location - The finest most charming hotel Rome has to offer, which is located in a central, quite and safe area in the heart of Rome' s historical centre, just 5 mins by walk from the Colisseum and the main attractions of Rome. 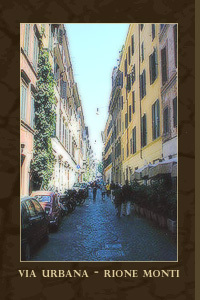 It is located in a ancient and elegant area called Rione Monti. Our accommodation provide you a strategical position and all the comforts you need to enjoy the Eternal City by walk! All main attraction are located in a walking distance within 15 mins! The Rione Monti - The Rione Monti is located few steps away from Piazza Venezia, the Colosseum, Trevi Fountain and the metro stop. The area is well served by public transport. The nearest bus stop is only at 300m away and buses run every 15 mins. Restaurants, theatres, cinemas, pubs and all you need to enjoy your stay is here!